Adding a sub-surface aeration system is the perfect way to increase your pond's or lake's water quality and oxygen levels while maintaining its natural appearance. Sub-surface aerators utilize diffuser modules that sit at the bottom of your pond and are connected by weighted tubing to an air compressor on shore. The compressor pumps much-needed air to the very bottom of the pond to de-stratify the water column and infuse oxygen into the water. The membrane on the diffuser breaks the air into tiny bubbles, which are released into the pond. As these bubbles rise to the surface, they carry the low-oxygen bottom water upwards, where it mixes with the oxygen-rich surface water. The constant mixing causes the water column to de-stratify, allowing harmful gases to be released into the atmosphere. 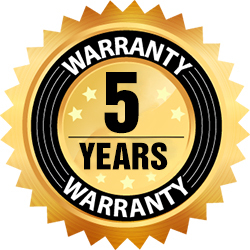 Designed for easy installation, our aerators come with a two-year warranty on the motor and a five-year warranty on the tubing and diffusers. They're great as pond de-icers too! This heavy-duty, rocking-piston compressor is designed for the demanding job of 24-hour operation, This is the same compressor we use in our Bubble Pro and Bubble Pro Mini sub-surface aerators, but will also work great with other systems. The oil-free design safely aerates ponds with no electricity in the water. The same air line tubing we use on all of our Bubble Pro sub-surface systems, available in 100-foot lengths, 3/8″ or 1/2" diameter. Weighted, thick-wall PVC is guaranteed not to crack or split, works in all temperatures, and can be installed easily even in cold weather! Fittings and clamps included. Protect your aeration compressor from the elements by using our weatherproof, molded-polyethylene cabinet. This economical enclosure features a built-in, 110-volt or 230-volt exhaust fan and louvers to allow fresh air circulation, along with perforated knock-outs for power cord and air lines. Tan color blends well into existing landscape. Measures 25" long, 15" wide and 15" tall. Made in Michigan! The North Star Fountain Aerator adds an elegant, trumpet-shaped water feature to any pond or lake along with powerful aeration, debris reduction and reliable algae control. The powerful North Star moves an impressive 600 gallons of water per minute, creating a strong surface current to help oxygenate water and eliminate algae and debris. Perfect for commercial, residential, and municipal applications, the North Star not only shines in the daytime landscape, but can also star after dark with a lighting option. You can order and add it now or at a later time. One of the newest additions to the Scott Aerator Company product line, the Atriarch fountain is a lovely addition to any pond or lakescape. The elegant look of the Atriarch, accompanied by the tranquil sound of its cascading water, enhances your outdoor living experience while adding value to your investment. The vibrant look of the Atriarch is achieved with a solid brass center nozzle surrounded by eight individual brass nozzles, creating a versatile water feature for both residential and commercial use. Engineered for all types of applications, the Atriarch will provide many years of maintenance-free performance. GFCI required, Please disconnect power when swimmers are present. Scott Aerator's Clover fountains create an impressive cascade of water that sounds as beautiful as it appears. The brass center nozzle of the Clover is surrounded by separate side nozzles which create a spectacular, angled spray pattern similar to the lucky plant it's named for. The brass center nozzle of the ½-hp Clover sprays at heights up to 20 feet, and it’s surrounded by separate side nozzles that create a spectacularly angled spray pattern, projecting water more than 15 feet at a 45-degree angle. The 1½-hp Clover’s main stream will reach heights over 40 feet and its side nozzle streams over 20 feet. Of course, either size Clover will help keep your pond better-aerated and healthier, too. Our Gusher fountains create a highly visible, wind-resistant vertical column of water that adds a magnificent focal point to your property. Around the base of the column, a frothy, highly aerated, cascading stream creates a "white boil" effect that not only sounds delightful, but also helps maintain water clarity. Further, its rapid flow adds abundant oxygen to your water, promoting a healthy aquatic environment while naturally breaking down decaying vegetation. And it deters mosquitoes from breeding. The Gusher's rugged design and stainless steel construction assure you of years of enjoyment in either fresh or salt water. Triad fountain will provide a spectacular focal point to your outdoor paradise while simultaneously vastly improving the health of your pond. Three individually distinct brass nozzles are included with this water feature, and all can be easily changed in minutes, and no tools required! The Triad gives you the choice between the more traditional geyser style of the “Gusher” nozzle, or a more elegant cascading pattern such as the “Cambridge” and “Rosewood” nozzles. All three will provide a dynamic, aesthetically pleasing addition to your pond or lakescape while helping to maintain water clarity, oxygen levels, and overall promoting a healthy aquatic environment. Scott Aerator is proud to present the Belcrest 1½-hp fountain. This impressive fountain moves 80 gallons of water per minute up to 30 feet high through eight adjustable brass nozzles, creating a classic, conical shape that will quickly become the focal point in any landscape. There are few more majestic sights than a fountain or aerator at night under lights. Scott Aerator offers an easy-to-install light kit made with heavy-duty, shock-resistant, water-cooled, Halogen floodlights, assuring you years of spectacular night viewing. Scott Aerator introduces the in-demand LED lighting line. 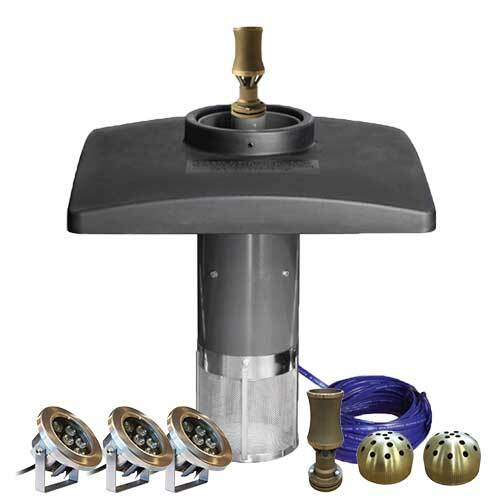 Choose from two- or four-light kits that install in minutes to your new or existing fountain. These commercial grade, long-lasting, energy-efficient, simple-to-use LEDs add a beautiful nighttime focal point to your outdoor paradise...and may make the neighbors green with envy. Our fully programmable oscillator attachment is a great option for our Dock Mounted De-Icer and Aquasweep products. We pre-program the Oscillator 360 to rotate your dock-mounted unit in 20-degree increments every 20 minutes. You set it for any radius you want, up to a full circle. Then plug it in and forget about it! The oscillator will help keep larger areas free from ice when used with the Dock Mount De-Icer, and will assist in moving more bottom debris when used with the Aquasweep. The Oscillator 360 can be added to in-place Aquasweep and De-Icer models. Made in USA, like everything else we manufacture. 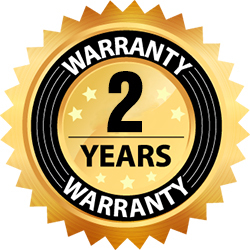 Comes with a two-year, unconditional warranty. Requires 110 volt power. A heavy-duty, stainless steel dock plate, pipe, and yoke assembly suspend the Scott Aerator Dock Mount De-Icer under the water’s surface. It mounts quickly and easily to almost any type of dock, and can easily be adjusted to accommodate different water levels. The Dock Mount De-Icer keeps ice from forming by bringing warmer water from the bottom and sending it out in a continuous agitated movement. This helps prevent dock pilings from being jacked, or lifted, by acting as a buffer to prevent ice expansion and pressure damage. Motor specs: 115 volts, 60 Hz, single phase, 10 amps, 680 watts. We also have 230-volt, many variations of 3-phase and 50-Hz models available. 12-gauge, submersible, 25-foot power cord with rugged Hubbell marine style plug included. 7 feet in length, 55 pounds. The Scott Aerator Slinger De-Icer can be suspended from a boat, pilings or dock by using nylon ropes (included) to fasten. This de-icer removes and prevents ice by bringing warmer water from the bottom and sending it out in a continuous agitated movement. It easily adjusts to compensate for varying water levels, and its heavy-duty design holds up in fresh and salt waters. Made for use in hard-to-reach areas and rapidly changing conditions, it's an economical solution to ice formation in large marinas and dock areas. Motor specs: 115-volt, 60 Hz, single phase, 10 amps, 680 watts. We also have 230-volt, many variations of 3-phase, and 50-Hz models available. 12-gauge, heavy-duty, 25-foot, submersible electric cord with Hubbell marine-grade plug included. The Scott Aerator Floating De-Icer is designed to keep large water surface areas open in the winter. Suspended from a float approximately 2 feet below the water's surface, it removes and prevents ice by bringing warmer water from the bottom and sending it out in a continuous agitated movement. The Floating De-Icer easily adjusts for variations in water levels, and its rugged engineering is perfect for both fresh and salt water. Motor specs: 115 volts, 60 Hz, single phase, 10 amps, 680 watts. We also have 230-volt, many variations of 3-phase, and 50-Hz models available. 12-gauge, submersible, 35-foot, heavy-duty power cord with Hubbell marine plug included. Manufactured by Intermatic, this heavy-duty timer is designed to save energy while extending the life of your Scott Aerator product. Its clock motors are self-lubricating, and its manual on/off override switch won't alter your program. An easy-to-follow wiring diagram and easy-set design makes this a perfect timer for both residential and commercial applications. Save energy while extending the life of your fountain! The Timing Center by Intermatic contains two timers in one steel outdoor enclosure. Perfect for our 115- or 230-volt units enhanced with one of our light sets, this rugged timing center is easy to set and comes with clearly identified manual on/off levers that won't alter your preset program. USA-built and maintenance-free, the tamper-proof design makes this the perfect timer for both commercial and residential applications. Includes knockouts to install switches or GFCI (not included), and comes with mounting hardware. Measures 10¼ inches long by 12 inches wide by 4½ inches deep. Introducing our de-icer in-line thermostat. Its outdoor, heavy-duty control box lets you "set and forget" your de-icer to run when temperatures turn frigid. Factory-set for an outside air temperature of 30°F, the thermostat automatically starts your de-icer and keeps it running until the air temp warms to 31°F or higher. Fully adjustable from 0° to 80°F, this product is UL-listed. Scott Aerator Concentrated water clarifier works to clear up murky, cloudy water by combining and settling suspended organic and inorganic particles, making pond and lake water appear clearer. When used as recommended, this product will pull organic particles such as decaying plant material, grass clippings, leaves and fish waste to the bottom of your pond or lake. It's also effective in clearing inorganic mud and clay particles. Our formulation is safe for plants, animals and fish when used at recommended rates. This product will not harm turf grass or other plants, so you can use pond water on grass and other plants treated with fertilizers and other chemicals. Apply one gallon of concentrated liquid flocculant per 250,000 gallons of pond or lake water by spray or direct pour. For best results, this product should be mixed with pond or lake water prior to being sprayed over the entire surface of the pond or lake. For problem ponds, a second application may be required within 48 hours of the first dose.